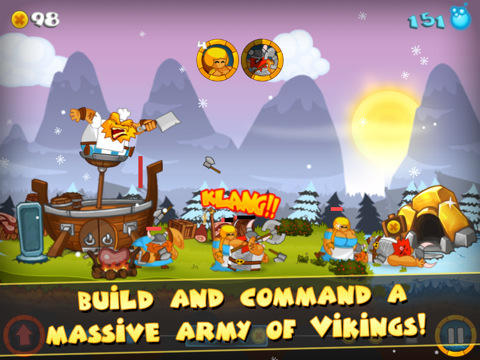 Chillingo have named their Swords and Soldiers HD app for iPad the funniest action-strategy game you will ever play. Oddly enough it is very similar in concept and gameplay to Trenches: Generals which I recently reviewed. The basic idea is that you create various units and send them off to do battle. In Swords & Soldiers HD you have option to play as the Vikings, Aztecs and Chinese, making your way through them as you play in campaign mode, or you can select your preference for a skirmish. Each of the civilizations has various options for upgrading for both the units and magical powers. Upgrades require gold which is collected by villagers, and putting your magical powers to use requires manna. Game center is integrated so the competitive types can make their way up leaderboards while earning achievements. Multiplayer is supported in a split screen mode. 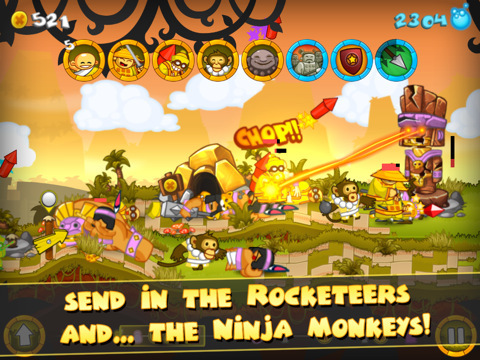 The graphics are good with cartoon like characters and comic like fonts and they definitely add to the fun that Chillingo were trying to incorporate in this game. Unfortunately as nice as the graphics are, the two dimensional horizon means that there is not much space for depth. The sounds of battle are reasonable, but become boring after a while. So it’s quite a fun game, and has pretty good graphics, but what do I think of it? Well, dispatching units requires a cool down period, so you can only send units out sporadically and it’s only really due to the various specs of the units that you have an army of a few units. After a few hours of playing it also began to feel like each game or level was like the next, and i cant say i will be picking it up again. Ultimately it’s about dispatching units as fast as you can and a mass of units pretty much always results in a win. I have to say that the AI is good and makes the battles fairly even and makes a win possible. The biggest disappointment for me was the initial price, I am really glad to see that they have lowered the price, but I do have to say that even at $2.99 it is a real stretch for my liking, and I would rather spend that money on the next game I’m going to review. AppSafari review of Swords and Soldiers HD was written by Richard Best on July 15th, 2011 and categorized under Action, App Store, Games, iPad apps, Strategy. Page viewed 4904 times, 1 so far today. Need help on using these apps? Please read the Help Page.